For Persis, her public life is that of a socialite, filled with parties and ball gowns. But while she seems to be a frivolous aristocrat, inside Persis beats the heart of a spy--the same heart that is falling for the enemy, Justen Helo. Persis's heart belongs to Justen, but before she can tell him the truth, she discovers he has a secret as well--one that could plunge their tropical paradise into another dark age. And Persis realizes she's not just risking her heart, she's risking the world she's sworn to protect. Centuries after wars nearly destroyed civilization, the two islands of New Pacifica stand alone, a paradise where even the Reduction--the devastating brain disorder that sparked the wars--is a distant memory. Yet on the island of Galatea, an uprising against the aristocracy has turned deadly. The revolutionaries' weapon is a drug that damages their enemies' brains, and the only hope is rescue by a mysterious spy known as the Wild Poppy. On neighboring Albion, no one suspects that the Wild Poppy is actually famously frivolous teenage aristocrat Persis Blake. Her gossipy flutternotes are encrypted plans, her pampered sea mink is genetically engineered for spying, and her well-publicized new romance with handsome Galatean medic Justen Helo . . . is her most dangerous mission ever. Justen is hiding things, too--his disenchantment with his country's revolution, his undeniable attraction to the silly socialite he's pretending to love. Persis is also falling for Justen, but when she discovers his greatest secret--one that could plunge New Pacifica into another dark age--she realizes she's not just risking her heart, she's risking the world she's sworn to protect. 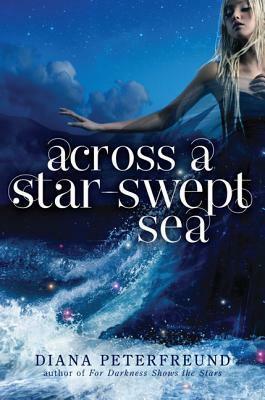 Inspired by The Scarlet Pimpernel, Across a Star-Swept Sea is a thrilling adventure in which nothing is as it seems and two teens from different worlds must fight for a future only they dare to imagine.